Cork County Council are once again sponsoring special music events in 2017 with local musicians lined up to provide recitals in towns across West Cork during the summer months. The scheme is designed to enable local voluntary music groups to work with local business groups to organise music events to be played on the town streets to attract visitors and increase economic development in West Cork towns. 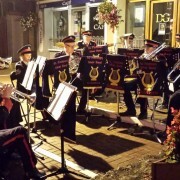 This Saturday, 27th May, sees Skibbereen’s own, St. Fachtna’s Silver Band kick off the inaugural event in town with a recital at 2pm on the Bridge in Skibbereen. 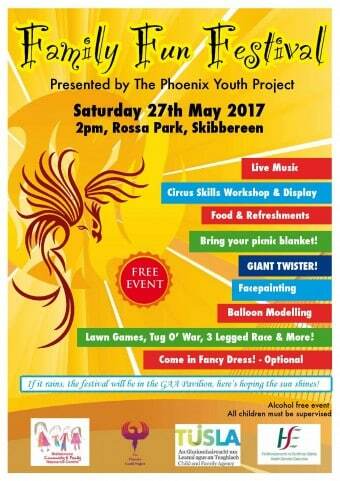 Please come along and lend your support and join in the fun. Skibbereen celebrates another historic rowing achievement with their “Super Six” arriving home to West Cork with medals galore! Shane O’Driscoll and Mark O’Donovan led the day with the first medal for Skibbereen – a gold! and no doubt inspiring the success that was to come. Denise Walsh kept the medals coming with a super race to finish in silver position topped with a fantastic surge at the end to secure a well deserved first European Championship medal. Our Olympic heroes Gary and Paul O’Donovan certainly didn’t rest on their laurels with another fantastic performance and nail biting finish securing another silver for Skibbereen. So what it is that makes this little corner of West Cork such a hotbed for rowing talent – steak, spuds, a drop of whiskey or lucky Penney’s socks? Or is it the dedicated coaching teams down through the years, the Ilen river on the doorstep, a super club set up that drives a great attitude and determined, hard working rowers who want to achieve of their best? At one stage yesterday Skibbereen led the medals table at the European Championship and ended by finishing 6th ahead of GB and Russia – what an achievement! and all led by Ireland rowing coach, our own Dominic Casey. Mark O’Donovan certainly summed it up as he put it, “ah Jesus Christ, we’re a great club altogether” and who are we to disagree? 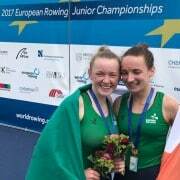 Huge congratulations to Ireland’s women’s double of Margaret Cremen and our own Aoife Casey on winning silver at the European Rowing Junior Championships in Germany this weekend, the first time Ireland has ever medalled in the competition. Aofie who is part of the successful Skibbereen Rowing Club, is the daughter of Eleanor and Dominic Casey, Ireland Coach and we congratulate them all from a very proud Skibbereen. Attention now turns to the senior European Championships which start later this week in the Czech Republic and we wish Ireland (and Skibbereen!) the best of luck. 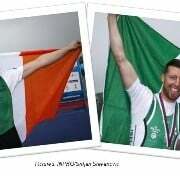 Skibbereen rowing is celebrating world success with super results at the World Rowing Cup in Belgrade, Serbia. Four Irish teams competed and all reached A finals – a great result so early in the season. 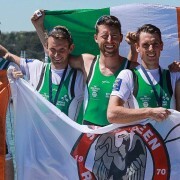 Skibbereen Rowing Club’s Shane O’Driscoll and Mark O’Donovan won gold medals in the men’s lightweight leading from halfway before crossing the line in first place. It was then the turn of Skibbereen’s Denise Walsh who rowed a fabulous race which saw her moving up from fifth at the halfway mark in the race to finish in silver medal position. Gary and Paul O’Donovan were next in the men’s lightweight double sculls and although they moved into third place with 500 metres to go they unfortunately couldn’t match the strong finishes of Great Britain, Czech Republic and Poland, who finished ahead of them. All in all a fantastic day’s rowing from the Skibbereen Club. 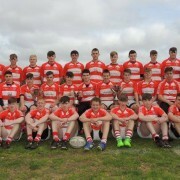 Skibbereen Rugby’s U16’s have now added the South Munster A league and the South Munster A Cup to the Bank of Ireland Munster U16 Cup which they won last month. This means the team are now the reigning Munster U16 Champions, South Munster A League Champions and the South Munster A Cup Champions completing a historic treble for Skibbereen RFC. The young team have played 26 competitive matches since the beginning of the season and won 24 of them – what an achievement! And they have also made history for the club by being the first team in Skibb RFC’s history to make it beyond the Pan Munster quarter finals, before they went onto win the final. Well done to all involved in the club – players, coaches, family, friends and supporters – SKIBB ABU! Cork ARC Cancer Support House’s annual West Cork Flag Day collections are set to take place in Bandon on Friday 21st April and in Castletownbere, Bantry, Ballylickey, Skibbereen, Clonakilty, Kinsale and Macroom on Thursday 27th April, 2017. Since 2015, with the assistance of Bantry Hospice, Cork ARC Cancer Support House have been providing cancer patients and their families in the communities of West Cork and South Kerry with support, information and practical advice, free of charge at their centre near Bantry. Cork ARC West Cork is open every Tuesday and Thursday from 10am to 4pm, and welcome anyone affected by cancer (patient or family member) to drop in or telephone without an appointment, to talk in confidence with a trained volunteer listener. Their West Cork centre also offers therapeutic massage, reflexology and counselling as well as a drop-in guided ‘Hour of Calm’ each Tuesday at 11:00am. Cork ARC Cancer Support House also offer those affected by a cancer diagnosis tranquil, safe spaces in non-clinical environments from their centre at Cliffdale, 5 O’Donovan Rossa Road in Cork city as well as drop in open mornings at the NICHE Community Health Project on Harbour View Road in Cork every Friday. This May, they will also open a cancer support centre in Youghal to serve the communities of East Cork and West Waterford this May. 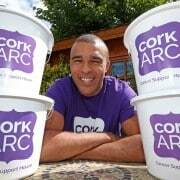 “Ahead of Cork ARC Cancer Support House’s 2017 Flag Day Collections in Cork City and County, their patron Simon Zebo calls on the people of Cork their generosity for the well know cancer support charity.” Picture: Jim Coughlan. 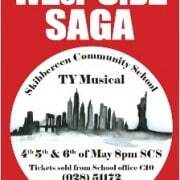 Skibbereen Community School’s TYs present West Side Saga, a musical taking place this Thursday 4th, Friday 5th and Saturday 6th May at 8pm in the School. 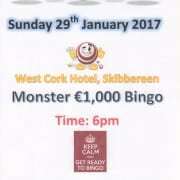 Tickets can be purchased from the school office – 028 51172 or from Cathal O’Donovan’s Skibbereen Bookshop. Tickets going fast so don’t miss out! 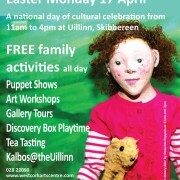 If you’re a regular visitor or you’ve never been here at all, this is your chance to come and see what’s happening at Uillinn: West Cork Arts Centre in Skibbereen. Our doors are open from 11.00am to 4.00pm for Cruinniú na Cásca, a new national day of cultural celebration, taking place on Easter Monday 17 April. A day packed with free family activities including the charming Listen Janey Mac, a puppet show from the acclaimed Cork-based Dowtcha Puppets at 11.00am and 2.00pm; Curiosity Art Workshops for children from 12 noon to 2.00pm; Tea Tasting with artist in residence Róisín Foley at 1.30pm; informative family friendly Gallery Tours at 12 noon and 2.00pm of Landmarks and Lifeforms, our current exhibition by Frieda Meaney and Danny Osborne; Discovery Box Playtime in the gallery for younger children at 3.00pm and if you feel like treating yourself, there is some beautiful, affordable art by artists from the Bantry region in the Foyer. Or just roam freely around the galleries, café and studios, meet the artists, view the artworks and explore local culture, all ‘Made in County Cork’! and free of charge. Kalbos will be open, serving delicious lunches and of course, wonderful coffee and home-made cakes – if the sun shines, the Courtyard’s the place to be. 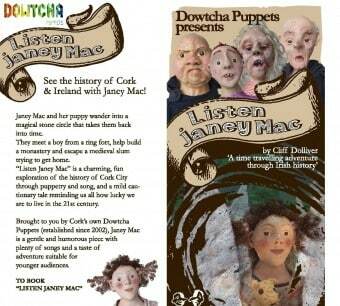 Listen Janey Mac is a charming and fun exploration of the history of Cork City and Ireland through puppetry and song. A mild cautionary tale, it reminds us all how lucky we are to live in the 21st century! 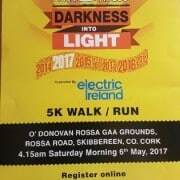 Darkness Into Light (DIL), Pieta House’s flagship annual fundraising and awareness event, started with approximately 400 people in the now iconic yellow DIL T-shirts walking the 5km course in Dublin’s Phoenix Park in 2009. 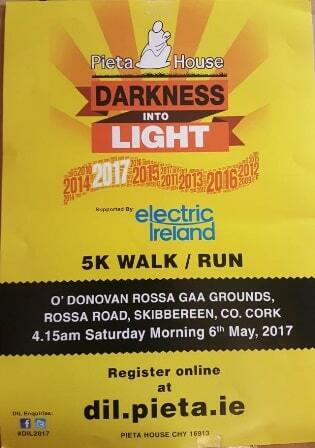 This year there will be 150 DIL venues across Ireland and worldwide including Skibbereen on 6th May. 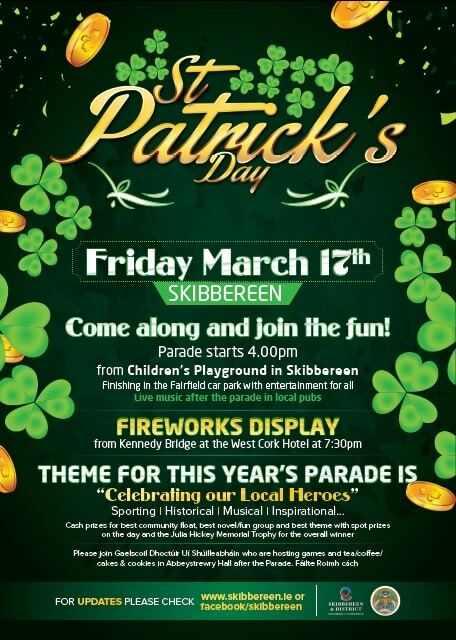 As the event will be taking place in Skibb for the first time the Chamber are asking that all businesses decorate their windows yellow the week before from Friday 28th April to raise awareness not only of the cause but the event in Skibbereen so please take time to turn the town yellow! 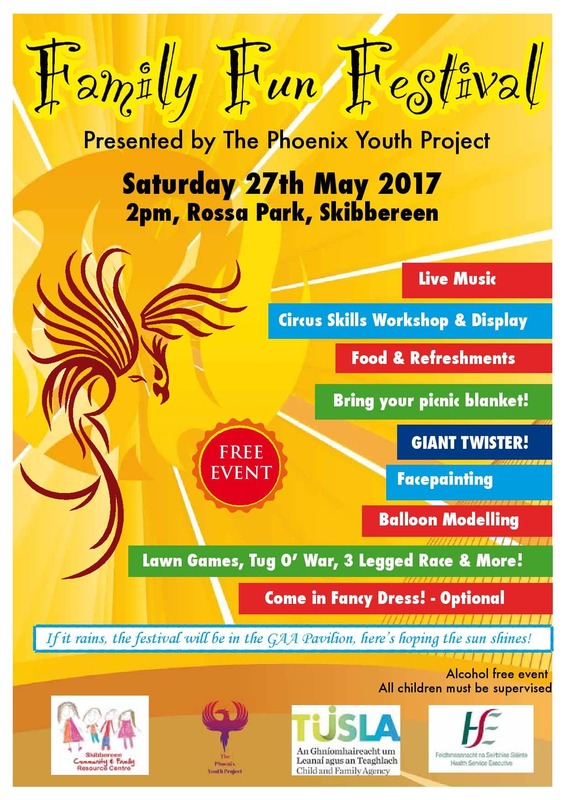 If you are available to help out with stewarding or with any other aspect of the event please contact Helen Dempsey on 086 8696128 – Thank You. Last year 130,000 people shared the light and helped to promote suicide prevention and to tackle the stigma that leads people to the doors of Pieta House centres. 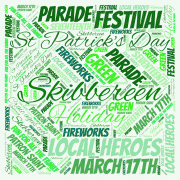 Plans are taking shape for this year’s St Patrick’s Day Parade in Skibbereen, which takes place on Friday 17th March at 4 pm. The route will start at the Children’s Playground on the Cork Road, move along North Street before turning right into Main St, past the viewing platform on the Bridge and finish in the Fairfield / Old Mart Car Park. Every year the parade is always a popular family event and this year’s theme is “Celebrating our Local Heroes” and we have so many to choose from – your local heroes can be inspirational, historical, musical or even sporting! It is great to see so many people getting involved every year in their local Parade which guarantees fun for all the family. As in previous years the Julia Hickey Memorial Trophy will be presented to the overall winner on the day with cash prizes for best community group, best fun group and best theme with spot prizes on the day too! 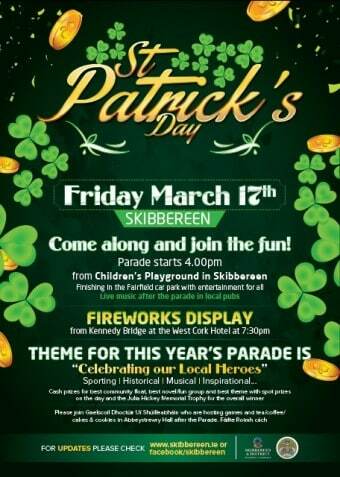 To finish off the evening in Skibbereen there will be an organised Fireworks Display at 7.30pm in the town, which will be visible from Kennedy Bridge and music in local bars to enjoy too. 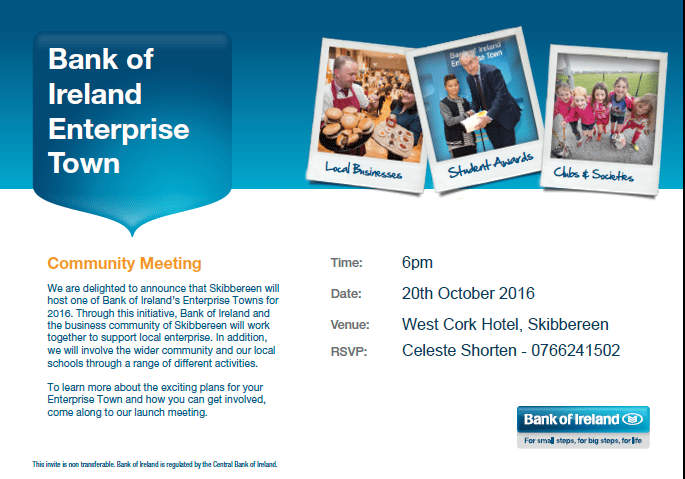 We would be delighted to see as many clubs and local community organisations getting involves on the day so please confirm if you are participating, so that we can gauge numbers on the day by sending an email to chamber@skibbereen.ie or text 086 2388300. 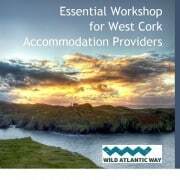 An essential guide for accommodation providers in West Cork, Harnessing the power of the internet, a workshop for all Bed & Breakfasts, Guest Houses, Hotels & Tourist Attractions takes place on Wed 1st March in the Ludgate Centre Skibbereen and aims to promote your accommodation and sell bed-nights using the internet. 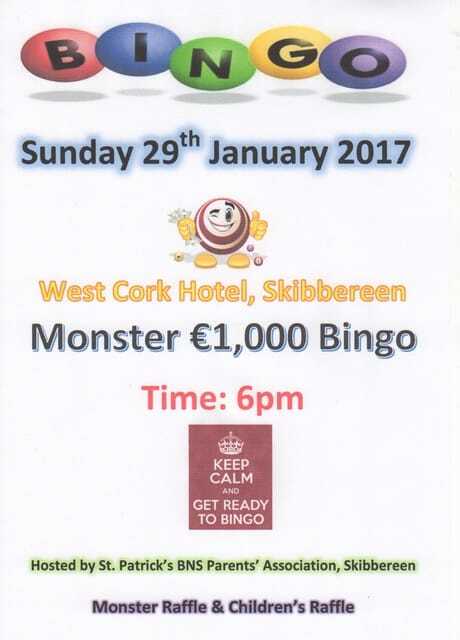 St. Patrick’s BNS Parents’ Association are hosting their annual family Monster €1,000 bingo on Sunday 29th January at 6pm in The West Cork Hotel, Skibbereen. Come along for a great evening of Monster Bingo with lots of fabulous prizes up for grabs. Children’s raffle also available. For more information please contact Noeleen on 086 3254214. Newstalk’s Down to Business roadshow was broadcast live from the West Cork Hotel in Skibbereen on Saturday 12th November during National Digital Week. If you missed the show you can listen below to local business owners John Field, Field’s Supervalu, Cathal Wilson Chairman of Skibbereen Chamber of Commerce and Director of Ceramicx in Ballydehob and Cathal O’Donovan of the Skibbereen Bookshop. On the Friday 2nd December Christmas Party Night kicks off festivities and launches the party season with a bang! the inaugural Christmas Charity Ball – a night of glamour and sparkle is not to be missed on Friday 16th December and this year the children’s charity BUMBLEance, The Children’s National Ambulance Service, are the nominated charity partner to benefit from the event. We’ve had a great year in Skibb! and have been well and truly in the public eye with our Olympic Rowers, homecoming celebrations, Tidy Towns’ successes and all things digital! 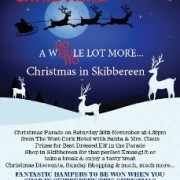 This year Christmas festivities get under way in Skibbereen with the annual tradition of the Christmas Parade which this year takes place on Saturday November 26th and everyone is invited to come along and join in the fun in the town. Santa and Mrs. Claus will be there to oversee operations as the Christmas Parade gets underway leaving the bridge on Ilen Street, near the West Cork Hotel at 4.30pm sharp, before making its way down Bridge St and Main St to the Square. This year the parade is bigger and better than ever with our Fire Service leading the way, joined by the Civil Defence (and a few surprises) as well as elves galore taking part hoping to win Best Elf prizes on offer. Santa and Mrs. Claus will be travelling in style this year on a horse drawn carriage, complete with Silver Bells and will be greeted in the Square by Skibbereen Comhaltas playing much loved, Christmas tunes. This year lucky winners from a competition run in local primary schools will have the unique opportunity to switch on the new Christmas Town Lights together with Santa, as Skibbereen lights up for Christmas 2016. 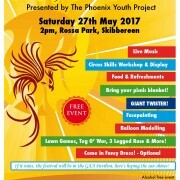 Remember you can keep up to date with what’s happening in Skibbereen by checking the Facebook page or www.skibbereen.ie. 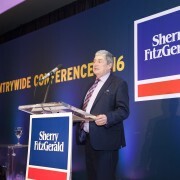 Congratulations to Sherry FitzGerald Franchise Of The Year winners, Sherry FitzGerald O’Neill, who have been shortlisted as one of four firms nominated in the upcoming Property Industry Excellence Awards in the Regional Excellence category. This prestigious event which will take place on 10th November at the Convention Centre, Dublin. Sherry FitzGerald have been shortlisted in 3 categories in total and are defending their crown as Residential Agency of the Year, Cushman & Wakefield are shortlisted in Commercial Agency of the Year along with SFO’Neill, the reigning Franchise of the Year for the Regional Excellence Category. Comment from Ray O’Neill – ‘We are both honoured and delighted to be finalists in the Property Industry Excellence Awards 2016. We are the longest established estate agency practices in West Cork. We started back in the 1930’s when West Cork would have been a rather insignificant place on the map of Ireland. Since then we have been through many booms and busts, emerging each time with lessons learned and a strong focus on what we need to do to ensure we succeed for the next eighty years, or more. West Cork has changed dramatically in the eighty years we have been in business, once a quiet backwater with a predominantly agricultural background it is now a vibrant, multi-faceted place where people from all walks of life and new business ventures are welcomed with open arms. We are proud of our West Cork heritage and endeavor to employ the best characteristics of West Cork, friendliness and straightforwardness, in our day to day dealings with our clients and the greater community. Our business is extremely customer centric and we are constantly striving to come up with ways of improving the experience for both sellers and buyers alike. We are firm believers in the benefits of using technology to improve our service but we are always keenly aware that there is no substitute for the personal touch. Our two offices in Clonakilty and Skibbereen service a territory of some 1,300 square miles, from the rugged beauty of the Beara Peninsula to the fertile heartlands of Timoleague, and everything in between. We have sold every conceivable type of property from cottages to castles and, although vast, we have an intimate knowledge of our territory with connections in every town and village. Photographer Shay Hunston invites the people of Skibbereen to take part in his photography project “People of the Wild Atlantic Way“. Shay is following the the route of the Wild Atlantic Way from Kinsale to Donegal, taking portrait photographs of the people living in the towns, villages and remote locations along the West Coast of Ireland and in each town and village he stages an exhibition of photograph. Starting on Monday 24th October, he will be taking photographs of local people for an exhibition to take place in the shop windows around the town, turning the streets into an open gallery. Upon completion of the project a book of photographs will be published and all the proceeds from the sale of the book will be donated to the RNLI – Royal National Lifeboat Institution. Cork Airport will also stage an exhibition of the photographs taken in West Cork. Online and print media in Ireland and abroad will also have access to the photographs. 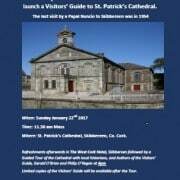 Shay has recently completed successful exhibitions of the people of Kinsale, Timoleague, Courtmacsherry and Clonakilty which you may have already seen and would now like to include as many of the Skibbereen business community in the project as possible. You can also find out more by logging onto Shay’s website www.shayhunstonphotography.com or contact Shay on info@shayhunstonphotography.com or 087-6507077. 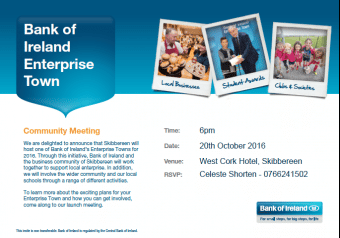 An information evening for Bank of Ireland Enterprise Town takes places this Thursday 20th of October in the West Cork Hotel at 6pm. 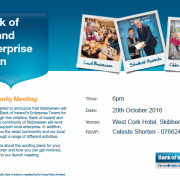 The Enterprise Town Event takes place on Friday evening, 25th November in the Skibbereen Sports Centre. Please come along to the Information Evening and find out how your business can get involved. On October 21st the Business Community is coming together for one night to raise vital funds for homelessness in Ireland today. Skibbereen and District Chamber of Commerce members, Violette, have signed up for the Shine a Light Night event and on the 21st October 2016 all of the staff will be staying in the shop overnight to raise money and awareness of homelessness in Ireland. Violette have sponsorship forms should people want to join in the fundraising and will also be collecting donations at the shop. A raffle will also be held on the night, so any Spot Prize donations would be very welcome. Sandie and Fiona and all the staff from Violette would be very grateful for any support you can give them in this worthwhile cause. 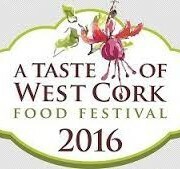 Plans are well underway for the annual A Taste of West Cork Food Festival which takes place, this year, from 9th-18th September 2016. Soak up the sights and indulge in fabulous fare during this year’s festival which promises food and fun-lovers a jam-packed programme filled with activities to suit the entire family – all set against the breath-taking backdrop of West Cork’s Wild Atlantic Way. While the picturesque Skibbereen remains the heart of the popular festival, events are taking place across the region with towns and villages such as Bandon, Bantry, Clonakilty, Schull and many more offering a warm welcome to visitors from far and wide. The 10-day event is a foodie’s paradise, with the regions best chefs preparing culinary feasts in local restaurants, food tastings, foraging walks, open-air markets, masterclasses, and intimate evenings with local artisan food producers on the menu. Cooking enthusiasts can also look forward to learning from the best, as guest chefs from all over the globe will be on hand to present demonstrations and share their culinary wisdom. Adventure lovers are invited to make the most of the area’s natural resources, with outdoor pursuits such as foraging, West Cork whale watching and catch ‘n’ cook experiences on offer. The vibrant calendar of events also includes something for the loved-up couples, who can enjoy a romantic moonlight kayaking experience or a long coastal walk along one of West Cork’s beautiful beaches. Indulge in all the good things in life by taking a big bite of the fun at this year’s A Taste of West Cork Food Festival! 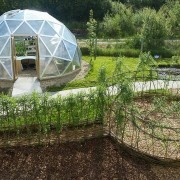 St. Patrick’s Boys’ National School, Skibbereen are very excited to officially open their new school garden and geodome this Saturday at 12pm. Recently voted Best New Garden in the Cork County School Garden Competition, the garden will also be featured on Nationwide later this month. The official opening has been organised in conjunction with A Taste of West Cork Food which will be launched this Friday. Mary Clear, co-founder of the Incredible Edible Movement in Britain will give a presentation on Saturday morning at 11am before the official opening. The event is open to all and the school welcomes anyone who would like to visit the garden. The Parents’ Association will provide homemade soup made from the organic school garden produce. 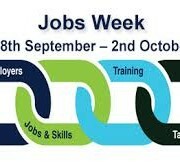 As part of National Jobs Week, the local DSP Employment Services are inviting local Skibbereen and District Employers to attend a briefing on the range of supports available to employers, including. JobsPLus, EURES, Free Vacancy Advertising and Job Matching Service; Wage Subsidy Scheme etc. all of which you may currently be unaware of and which are designed to support your business recruit jobseekers. Employers are also invited to take a free stand at the Jobseeker Event which takes place from 10.00-12.00 following the employer’s briefing and will also be an opportunity to meet local Jobseekers and advertise any current vacancies you may have. To register interest in either/both events, please email bantryemploymentservices@welfare.ie or ring Maureen Canty on 086 8229366. Advertising your Job Vacancy in Europe through EURES (European Employment Services) which gives employers access to a database of European jobseekers and provides specially tailored European recruitment projects for employers. Jobs PLus – This is an employer incentive from the Department of Social Protection which encourages and rewards employers who offer employment opportunities to the long term unemployed and offers up to €10,000 for a qualifying recruit, payable on a monthly basis over a two year period. Being an inclusive and disability friendly employer also has many benefits for employers.